Collingwood were too efficient from North's turnovers today. They created five more scores from intercepts. Taylor Adams was a standout with 27 disposals, 15 handball receives and 8 score involvements. Young forwards Ben Brown and Corey Gault have been influential with 10 and 6 marks respectively. However, it has been their goal kicking which has separated the pair. Gault has 3.0.18, whilst Brown has 1.2.8. Collingwood's pressure has increased significantly in this half, winning the tackle count 2215. This has enabled them to create eleven intercepts. Collingwood have won 5 clearances in their attacking half to North's 1 and have generated two goals from this source. Whilst, North have won 5 clearances in their defensive half to North's 0, but have not created a goal from this zone. North Melbourne has primarily used the corridor to score, kicking 40 per cent of goals from the corridor. Alternatively, Collingwood have scored 83 per cent of their goals from the left and right sides. Collingwood has been able to increase their advantage this half, primarily through intercepting in their attacking half. They have created eight intercepts to one in this zone and generated five scores. 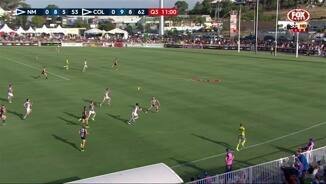 Collingwood has made an effort to use ran and carry to transition out of defense.There kick to handball ratio is 0.93 to 1 in their defensive half and 1.21 to 1 in their attacking half. North Melbourne's eleven kicking clangers in their defensive half has hurt them in this game. Collingwood has created a goal from 40 per cent of these turnovers. North Melbourne has had four unforced turnovers in the midfield this quarter to Collingwood's 0. However, Collingwood have failed to punish them and as result both teams have 2 goals from intercept possessions. Although, North Melbourne has won 66 per cent of centre clearance, Collingwood has generated two goals to North Melbourne's one from this source. Both have come in this quarter. Despite, generating four scores from intercepts in their attacking midfield Collingwood are only winning the quarter by 3. This is due to North Melbourne's kicking efficiency of 84 per cent, which has allowed them to generate 2 goals from 4 inside 50's. Levi Greenwood has had a big game so far against his old club. He has 10 contested possessions, four score involvements and five clearances. Collingwood are dominating the early stages of the second half. They have 22 disposals to 4 and have generated a 2.1.13 from all three intercepts in their attacking half. Collingwood InterchangeJackson Ramsay off due to an injury. 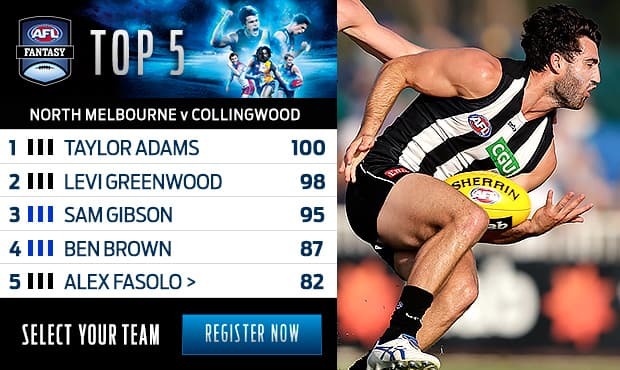 Taylor Adams is leading Collingwood with 14 disposals and five score involvements. Whilst, Andrew Swallow had 12 disposals, four score involvements and three clearances in the second quarter. On the other hand, Collingwood were clinical in the forward half. They generated an inside 50 from 83 per cent of chains in their attacking half. In particular, they created four scores to the Kangaroos two in their forward 50. After struggling in the first quarter, North Melbourne have cut the lead to just six points. In that half, they won six more clearances and as a result generated an extra goal from this source. North's two twin towers have had a major impact in this half. Ben Brown has a game high six marks and Drew Petrie has a game high five score involvements. Although Collingwood's disposal efficiency is 11 per cent greater in this quarter. North Melbourne has been more clinical, generating a score from 44 per cent of intercepts. Andrew Swallow has had a highly influential 12 minutes. He has ten disposals, four clearances including four centre clearances and four score involvements. Collingwood InterchangeTom Langdon off due to an injury. It has been North Melbourne's ability to create four intercepts in their attacking half and translate these into three scores, which has allowed them to cut into Collingwood's lead. Collingwood has now made three unforced turnovers in their defensive half, which have been punished with scores. Last season North Melbourne were the fifth highest team for conceding scores from clearances. In the first quarter Collingwood has generated 71 per cent of their scores from this source. Last year they were ranked fifth in this category. North Melbourne's kicking efficiency is 31 per cent higher in their forward 50 and is keeping them in the game. They have been particularly efficient after winning clearances, scoring a goal from 40 per cent of their clearances. Collingwood have won five of the last six clearances and have been clinical. They have generated four scores from this source. Primarily this is due to Levi Greenwood, who has 3 clearances, in which two have launched goals. Collingwood is leading the inside 50 count 124. They have created an inside 50 from all 5 of their 5 intercepts in their defensive half. However,all three of their goals have come from the five possessions created in their attacking midfield. Collingwood has won the last five clearances and generated two goals from this source. Both teams are electing to use different methods to transfer the ball. North Melbourne has moved the ball aerially with eleven marks to zero. Whilst, Collingwood is using their run and carry with 14 to 8 handball receives. After, a costly turnover resulting in the first goal to Collingwood. North Melbourne has responded, they have won the first three clearances of the game and generated their first goal from this source. In Collingwood's first NAB Challenge win, they recorded a higher disposal efficiency and won more uncontested possessions. This seems to be a barometer, as they lost 9 of 10 games when they were less effective in these stats last year. North Melbourne could be moving towards a kickingorientated game-plan. 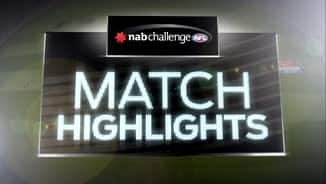 In their first NAB Challenge match, they recorded a kick to handball ratio of 1.53: 1, which ranks number one in the competition and is 0.28 higher than last year. Collingwood's captain, Scott Pendlebury loves playing the Kangaroos. In the last five years, he has four games with more than 30 disposals and ten score involvements. Welcome to Robertson Oval (Wagga) for the North Melbourne v Collingwood Round 3 clash. IT WAS billed as the day North Melbourne regained Daniel Wells, but it could be remembered as the moment another star was born after Taylor Adams propelled Collingwood to a hard-fought eight-point NAB Challenge win on Saturday. In oppressive conditions at Robertson Oval in Wagga Wagga, the Pies outlasted the Roos in an entertaining and see-sawing contest, 0.12.13 (85) to 1.10.8 (77). On the day his mentor Paul Couch passed away suddenly, Adams drove Collingwood's second win of the pre-season, showing his true class booting two goals and racking up 26 disposals. Adams drilled a spearing shot on the run to nail the game's opening goal and never took his foot off the pedal, despite the mercury soaring to 38 degrees. The 22-year-old's poise in traffic and exquisite skills made those around him look better, and the speedster seems ready to take the next step in his career. "Taylor's had a really strong pre-season, he's a leader of the team and I don't think he knows the difference between a NAB Cup game and home and away game," Pies coach Nathan Buckley said. "He just goes flat out all the time, which is why he's so well-respected by his teammates." Teammate Levi Greenwood, facing his old side for the first time, was another of Collingwood's best with 25 disposals in a typically hard-working effort. His performance mirrored Wells' impact for North, whose blend of young and experienced players lost no admirers. Wells was a welcome sight back in Roos colours after 328 days on the sidelines and he wasted no time getting into the swing of it with the game's first kick. The trimmed-down veteran sparked the Roos at centre clearances and covered plenty of ground in a confidence-boosting outing after lingering Achilles trouble derailed his 2015 campaign. "He's been doing that all pre-season. 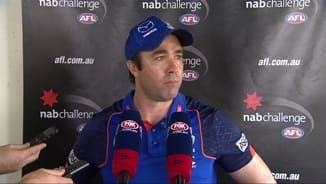 So he's in pretty good shape and pretty well-prepared," coach Brad Scott said. "We hope he can improve (on past performances). Whenever he's prepared well in the pre-season he's generally had a good season." Reigning club champion Todd Goldstein picked up where he left off, while running machine Sam Gibson, skipper Andrew Swallow and captain-in-waiting Jack Ziebell were tireless throughout. After slamming on 21 goals against the Cats last week, the Magpies’ transition from defence to attack appeared slick again, although Buckley rued some of his side's skill errors. The Pies' numerous avenues to goal – among them Travis Varcoe, skipper Scott Pendlebury, rookie Corey Gault (three goals) and a rejuvenated Alex Fasolo – are sure to excite fans in a reduced interchange era. However, Travis Cloke's goalkicking woes continued with the spearhead missing two very gettable set shots in the second term and finishing goalless. At the opposite end, twin towers Ben Brown and Drew Petrie were in great touch, with Petrie bagging three goals in the second term to briefly hand North the ascendancy. North Melbourne: Daniel Wells is desperate to resurrect his career and prove his doubters wrong in double-quick time. In his first competitive hit-out since round two last year, the 31-year-old looked to have regained his trademark zip and hasn't lost his football nous. Another A-grade outside midfielder-forward is precisely what the Roos needed and, with recruit Jed Anderson eager to impress, North will run a few teams ragged this season. Collingwood: The Pies' powerhouse 21-goal display against Geelong wasn't a one-off. Nathan Buckley has built an array of weapons into his forward setup, with Alex Fasolo, Taylor Adams, Darcy Moore, Corey Gault, Travis Varcoe, Jarryd Blair, Mason Cox and resting skipper Scott Pendlebury offering strong support for birthday boy Travis Cloke. Throw Jamie Elliott (back), Jeremy Howe (finger) and Dane Swan (rested) into the mix and there aren't many more versatile or dangerous line-ups. North Melbourne: Mitchell Hibberd dropped a mark he would normally have taken early, although he recovered well so that it didn't cost his side or affect his confidence in a mature performance. Ryan Clarke and Declan Mountford came on after half-time. Mountford showed he's no sucker, not buying a dummy from Brayden Maynard and catching him holding the ball. Clarke ran hard in limited minutes while Farren Ray was relatively quiet with 10 touches. Collingwood: James Aish racked up 19 disposals in another encouraging outing in black and white. Tom Phillips copped a knee to the back in a marking contest early, but in a positive sign he buttered up at the next stoppage and was hard at the contest throughout. Brayden Sier spent the opening half on the bench and although the No.32 pick was quiet, he will have learned plenty after the long break. Both teams will converge on Etihad Stadium next Saturday for their final tune-ups leading into round one. The Pies take on the Western Bulldogs in the afternoon on March 12, before the Roos face the Hawks later that night.